NASHVILLE, TENN. (March 21, 2007) ‹ The fascinating story of rockabilly music and its powerful influence on popular music and American culture comes to life in THE ROCKABILLY LEGENDS: THEY CALLED IT ROCKABILLY LONG BEFORE THEY CALLED IT ROCK AND ROLL, a one-hour documentary airing as part of PBS pledge drive programming beginning this month and continuing for the next three years (check local listings). The story is also vividly told through photographs and narrative in a beautifully designed, 256-page companion coffee table book by the same title, written by Jerry Naylor and Steve Halliday and published by Hal Leonard (ISBN: 13 978-1-4234-2042-2; Hardcover; $35). The book, which includes a DVD with a one-hour producer's cut of the documentary, is currently being offered as a PBS pledge premium and is also available in stores and online through various retail outlets. THE ROCKABILLY LEGENDS documentary, a project seven years in the making, was produced and written by Jerry Naylor, a personal friend to many of the rockabilly legends and former lead singer of The Crickets after the untimely death of Buddy Holly. Introduced by actor, singer and songwriter Kris Kristofferson, and co-hosted by Rock and Roll Hall of Fame inductee Red Robinson and Naylor, THE ROCKABILLY LEGENDS is narrated by game show pioneer and television icon Wink Martindale. It is a treasury of never-before-seen performance footage and photographs, as well as exclusive interviews with and about the pioneers of rockabilly music. These musical icons‹Elvis Presley, Carl Perkins, Johnny Cash, Roy Orbison, Jerry Lee Lewis, Buddy Holly, Buddy Knox, Gene Vincent, the Johnny Burnette Trio and others-- forever altered the musical world by combining elements of country, blues, hillbilly, gospel, African American spirituals and bluegrass music. The program recounts their remarkable journeys from the cotton fields and country churches of the rural South to the honky-tonks and recording studios of the big city Š and then on to the world's stage, where their music gave birth to rock and roll. Woven throughout the documentary is commentary from producers, family members, band members and other musicians-- including Cowboy Jack Clement, John Carter Cash (son of Johnny and June Carter Cash), Stan Perkins (son of Carl Perkins), Sir Paul McCartney, Charlie Daniels, Billy Burnette (formerly of Fleetwood Mac and son of Dorsey Burnette) and music historian Bill Griggs--telling the story of how rockabilly was created and how its effects were felt not only in the U.S., but around the world. The documentary explains the incomparable influence of Sam Phillips and Sun Studios, Tillman Franks and the Louisiana Hayride, the Grand Ole Opry, and Norman Petty Studios and the growth of rockabilly in West Texas. A live studio performance of the program theme, "They Called It Rockabilly Long Before They Called It Rock and Roll"‹performed by Stan Perkins and Jerry Naylor‹was recorded specially for this production. Also available as PBS pledge gifts are a 12-track CD of master recordings by the rockabilly legends, digitally refurbished and restored for this project, including Elvis Presley's performance of "That's All Right, Mama" on the Louisiana Hayride in October 1954; a 4-CD set containing 80 master recordings, each CD containing a special live performance bonus track; and a 2-DVD set containing the original 3-hour documentary, plus 45 minutes of bonus footage. 2-DVD set featuring the original 3-hour version of the documentary, plus 45 minutes of bonus footage Four newly recorded documentary soundtrack CD's--three featuring Jerry Naylor paying tribute to the Rockabilly Legends, and one honoring the music of the legendary Carl Perkins. Naylor recorded the latter with special duet partner Stan Perkins, son of the late rockabilly icon. Eight compilation CD's filled with original master recordings of the best-known Rockabilly Legends' hits, each digitally refurbished and restored by The Naylor Company and Patrick McGuire Recording for this package. Each disc also contains a rare live performance bonus track. The bonus tracks were culled from performances by The Everly Brothers, Bill Haley & The Comets and Gene Vincent. A Live at the Louisiana Hayride CD featuring Elvis' first recorded live performance on the Louisiana Hayride in October 1954, plus live Hayride performances from Johnny Cash, Johnny Horton and Bob Luman, and a very rare 1952 live recording of Hank Williams' last performance at the Hayride. 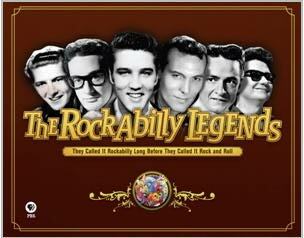 A CD containing interviews with the Rockabilly Legends, conducted by legendary radio and television personality Red Robinson. Inducted into the West Texas Music Hall of Fame in 1998 and the Rockabilly Hall of Fame in 2000, Jerry Naylor is a Grammy®-nominated, fifty-one year veteran of the entertainment business, as a performer, songwriter, and record producer. He was a regular on the ABC-TV music variety series Shindig in the mid-'60s, and hosted the nationally syndicated television series Music City USA from '67 to '68 and the syndicated country music radio show Continental Country from '74 to '76. Steve Halliday, author of several best-selling books, worked for many years in newspaper publishing and reporting, and is now president of Crown Media, Ltd., a literary company that specializes in book editing and collaboration.